Forty years ago, this writer drove the first Cat D10 dozer delivered to Canada. The brute was the centrepiece of a well-attended press conference at Hewitt Equipment in Pointe Claire, Que. When things began to slow down, I evidently put a bug in the ear of the right person and was allowed to climb up into the operator’s seat. Under supervision I fired up the engine and drove perhaps two or three metres forward, then back. The memory of that opportunity still excites the tom boy in me. The first Cat D10 production model in 1977. 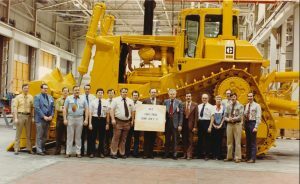 PEORIA, Ill. – Forty years ago this September, Caterpillar rolled off of its production lines 10 pilot models of the world’s largest, most powerful dozer, destined to leave a lasting legacy on the industry. The Cat D10 dozer’s radically different design, high weight and horsepower, and resilient undercarriage answered the growing calls from large mining and big heavy construction operations for a more powerful dozer. The result of Cat’s patented elevated sprocket design was a machine with no rival for weight, power or productivity. Offering 50% higher productivity than Caterpillar’s largest dozer of that era, the D9 dozer, the D10 weighed over 86,180 kg and measured 4.6 metres tall, 3.7 metres wide and slightly more than 9.4 metres long. Power was supplied by the 522 kW D348, V12 diesel engine. Two years of testing led to the first elevated sprocket patent application and ultimately building the first two D10 test models in August of 1973. By separating the drive sprockets from the track roller frame and elevating them above the tracks, more track remained on the ground for improved traction. The elevated sprocket design was also better able to absorb ground shocks for longer life and greater operator comfort. The pilot D10 dozers built in 1977 were immediately embraced by Caterpillar customers. Their ripping and pushing capabilities made a significant impact on the mining industry, as studies showed the cost per metre to move material using the D10 was comparable to that of larger draglines. The resilient undercarriage with elevated sprocket conformed to the ground better than solid tracks, helping to improve machine pushing power and undercarriage life and enhancing operator comfort. The dozer’s modular concept helped to increase machine transportability, as removable components facilitated machine moves from location to location. Its modular design also substantially advanced assembly and service task efficiency. Caterpillar will be happy to answers reader enquiries at www.Cat.com/requestCatinfo.